Rod and I decided to head out for another night fish and venture to a location we had not been to in a while. 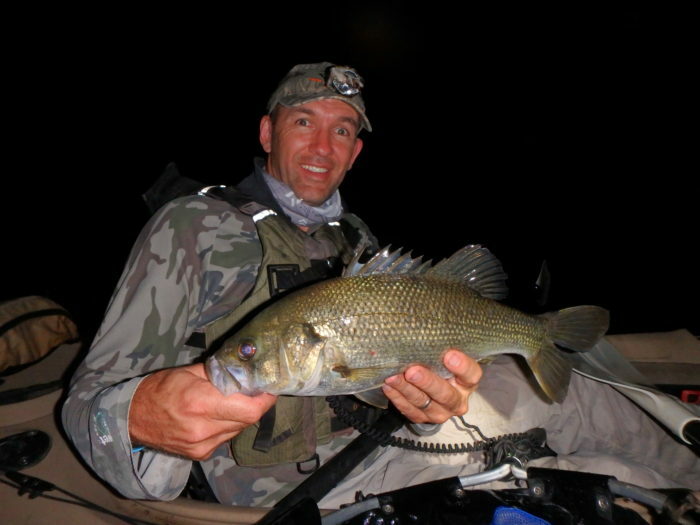 This system is notorious for huge bass and although we have only managed fish to the mid-forties at night, the possibilities continuously bring us back in the hope of finding some river monsters. I had the opportunity to leave early, and so I packed the car and arrived at the destination well before sunset. This gave me the chance to scope out the river a bit in the light of day which in the past had rewarded me with some cracking bass off the surface well before darkness descended. Arriving at the launch point, I was a little disappointed to find that there was quite a strong breeze about, and although not blowing consistently I knew it would cause me a few issues with positioning the yak and casting. I hoped that once on the river I would be protected a little and that eventually as night fell the breeze would eventually dissipate. Sliding into the water the wind was slightly less exuberant, however it was still blowing hard enough to cause me some difficulties and I lamented that if it continued into the night I would have to call the session a little short. As it was I still managed to send some accurate casts into all the assorted nooks and crannies with almost no interest in my lure at all. Only a single tiny love tap was my reward during the daylight and that could have been a small bass or even a spangled perch that also resided in the river. As the light faded from the sky I moved up to the section of river we typically target. Mostly because of the familiarity which at the very least gives us some confidence in casting into structures with a reduced chance of snagging up lures. Finally after what seemed an age I finally managed three consecutive hits and managed to stay connected to two of the bass. The first measured a respectable 31cmFL while the other was so small I didn’t take the time to lay it on my brag mat. 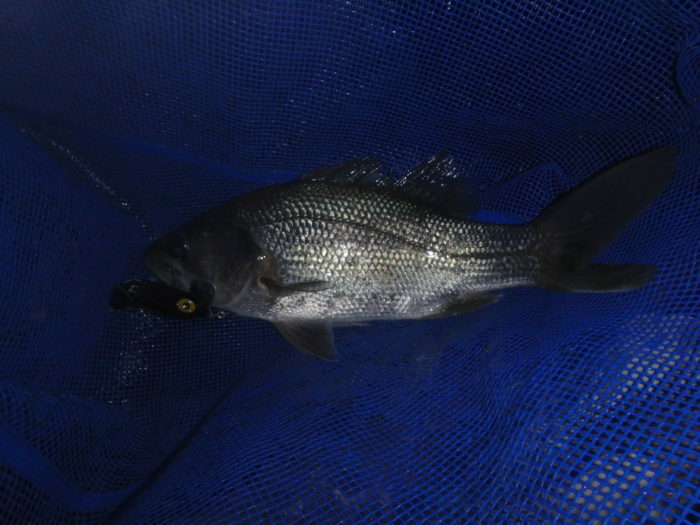 The fishing suddenly went quiet again for a short period before I eventually missed another surface hit at the front of a large, spindly, submerged tree before sending a dangerous cast to the back of the tree and hooking up on another small bass of 28cmFL. If it had been any bigger, I would imagine I would have been a lure short as it took a fair amount of effort to extract the bass from the back of the timber. Eventually the wind disappeared with the sun, and as a result I could hear the sound of a yak being dragged across rough terrain in the distance before I saw a headlamp bobbing through the bush. 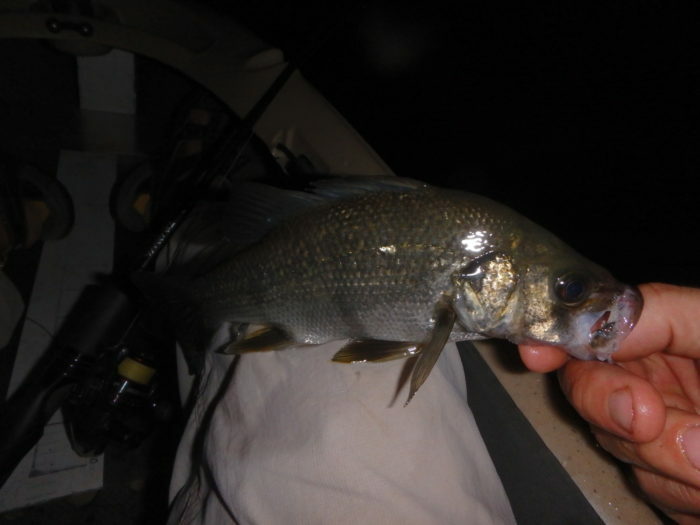 As Rod made his way up the river to where I was fishing I managed my fourth bass of the night at 25cmFL. We then spent a few hours of mindless, elbow flexing as cast after cast splashed down into every conceivable strike zone with no reward. It’s usually at this point that the lure gets belted, and because your mind is somewhere else entertaining itself you miss opportunities and leave with that feeling of “if only”. Well the fishing gods were smiling on me this day as after hours of nothing my Arbogast Jointed Jitterbug had a good bass smash it off the top and the heavy load in my rod told me it was a good fish. In the back of my mind I must admit I had written it off as a catfish, as after hours of tedium it couldn’t have been a bass. Well I was wrong and after a solid fight out in open water I finally netted a quality fish of 42cmFL. So we turned around and headed back downstream. 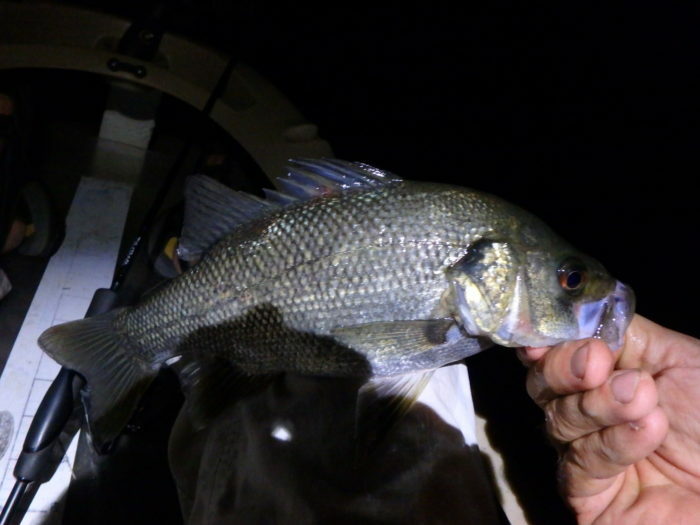 Rod went further afield and I cast at the two hot spots from earlier in the night but the bass were just not playful. In the end we called it early and headed home, at least I had managed some reward for the effort we put in.